We are the leading manufacturer of Clutch Shaft. We manufacturer Clutch Shafts as per OEM standards (Original Equipment Manufacturer) For Ape Piaggio. Please contact us Only If You Need Number 1 and 100% Genuine Parts. 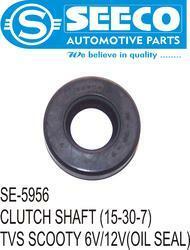 We have gained a remarkable position in the market that is involved in offering Clutch Shaft. 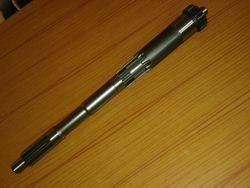 Clutch Shaft made of Steel Round. - Used in clutch system in Road Rollers. A clutch is a mechanical device that engages and disengages the power transmission, especially from drivingshaft to driven shaft.We hold expertise in manufacturing and supplying wide assortment of high quality clutch shafts for tractor & automotive engine. Neema Forge Press Pvt. Ltd.
Keeping in mind, ever-evolving requirements of our valuable clients, we are offering an exclusive range of Clutch Shaft (Atul Shakti). The offered range is manufactured using high grade raw material and latest technology in compliance with international standards. Our esteemed clients can avail this array at competitive prices.